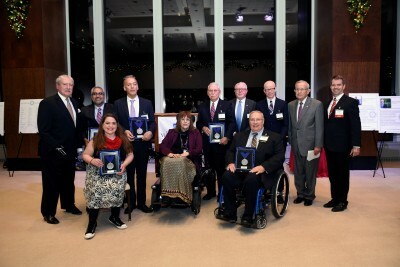 NEW YORK, USA: The Viscardi Center — an Albertson-based non-profit organization providing a lifespan of services that educate, employ, and empower people with disabilities — announced ten recipients of the 2018 Henry Viscardi Achievement Awards at a ceremony held on December 4 at the Mutual of America building in New York City. 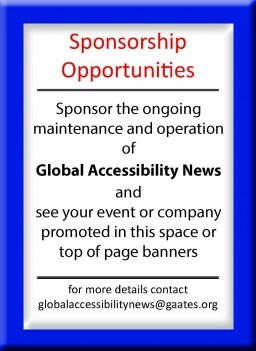 First bestowed in 2013, the awards honor exemplary leaders in the global disability community who, through the example of their professional accomplishments and advocacy efforts, are reshaping societal perceptions and making significant changes in the quality of life of people with disabilities. Drawing nominations from cities throughout the U.S. and countries around the world, this year’s group is accomplished and diverse, representing Israel, Malawi, Pakistan, Switzerland, the United States, and Zimbabwe. Recipients come from a variety of distinguished backgrounds, including academia, entertainment, government, technology, and the non-profit sector. The Henry Viscardi Achievements Awards commemorate the vision of the Center’s founder, Dr. Henry Viscardi, Jr., who himself wore prosthetic legs. A premier disability advocate, he served as an advisor to eight presidents, from Franklin D. Roosevelt to Jimmy Carter, and implemented groundbreaking employment and education programs that continue to improve the quality of life for people with disabilities. The 2018 Selection Committee was co-chaired for the sixth consecutive year by Robert Dole, former U.S. Senator, along with Sherwood “Woody” Goldberg, Esq., retired U.S. Army Colonel and current Senior Advisor for Asian Affairs at the Center for Naval Analysis. Dr. Darvishy has dedicated his life to empowering people with disabilities through cutting-edge accessible technology. As a professor at the Zurich University of Applied Sciences in Switzerland, he serves as the head of the ICT Accessibility Lab, where he oversees research and development of ICT-based solutions for people with disabilities and the elderly. In addition to his academic career, he has carried out several groundbreaking accessibility projects in Switzerland, including talking ATMs for people with low vision. In 2016, he received UNESCO’s prestigious Prize for Digital Empowerment of Persons with Disabilities. General (ret.) Frederick M. Franks, Jr.
General Franks is a 1959 graduate of the U.S. Military Academy. After being severely wounded in combat in Cambodia in 1970 and having his left leg amputated below the knee, he fought to remain on active duty in a combat unit. Later, Gen. Franks commanded the first Gulf War 146,000 Soldier VII Corps in the successful “Left Hook” maneuver in a coalition to liberate Kuwait. VII Corps fought and won the largest tank battle in the history of the U.S. Army. While serving in the Vietnam War, he was awarded the Silver Star, Distinguished Flying Cross, the Bronze Star with V Device, the Air Medal, and two Purple Hearts. He retired from active duty in 1994 and continued as a strong advocate for Wounded Warriors. He founded a Southwest Florida Home Base Program in 2014 for local veterans and now serves as Honorary Director. Currently serving his fourth term as a member of the Knesset for the Meretz political party in Israel, Ilan is the first politician in his country to have a visible disability. He began his career when he successfully enlisted in the military after initially being refused. It has been his ongoing mission to make Israel a more accessible, accepting, and welcoming nation. As a result of his work, revolutionary new regulations were set in place that called for accessibility in public areas. As the Equal Employment Opportunity Advisor for the Army Regional Health Command—Pacific, Thomas’ accomplishments include assisting office managers to accommodate employees with hidden disabilities, collaborating with a women’s trade union to establish guidelines for accommodating individuals with disabilities in trade occupations, and drafting employment-related policy recommendations to the Governor of Washington to improve outcomes for individuals with disabilities. He attended the Henry Viscardi School at The Viscardi Center for several years and is a member of the Civil Air Patrol-US Air Force Auxiliary. Prudence Mabhena is an award-winning singer-songwriter from Zimbabwe. Born with a disability into a society in which people with severe physical disabilities were often feared and abandoned, Prudence grew up fighting to overcome discrimination and remain visible in her community. Her journey was the topic of the 2010 HBO documentary Music by Prudence which won an Academy Award. Prudence attended the ceremony in Los Angeles. She was named a UNICEF National Ambassador in 2011 and today, continues to advocate for the disability community, while also creating new music and coaching aspiring musicians. Bonface has spent nearly a decade defending the rights and social inclusion of people with disabilities in Africa, primarily those with albinism. His unwavering leadership qualities manifested in the fight for the rights and protection of persons with albinism, especially those in Malawi who were being targeted for ritual sacrifices between the years of 2013 and 2018. A former president of the Association of Persons with Albinism in Malawi, he later took on the role of national director and worked to educate local authorities about the attacks against those in the albinism community. Bonface was named the inaugural award winner of the Bari-Bari Prize for outstanding albinism advocacy in 2015. Based in the Sindh province of Pakistan, Jawaid has spent his life advocating for policies and initiatives that protect the rights of people with disabilities. As president of the Disabled Welfare Association and through his leadership in the Community Based Inclusive Development Network, he was instrumental in the passage of the Empowerment of Persons with Disabilities Act, 2018 by the Sindh Assembly. He also successfully convinced the Chief Minister of Sindh to increase the disability job quota from 2% to 5% and helped to ensure government jobs to more than 80 qualified men and women with disabilities. Maria is the director of the Mayor’s Office for People with Disabilities for the City of Houston where she advocates for the rights and needs of citizens with disabilities and serves as a liaison between the mayor, city council, city departments and other public and private entities. Some of her most recent work has focused on Hurricane Harvey response, recovery, and rebuilding for people with disabilities and seniors. She is the former senior associate director in the Obama White House Office of Public Engagement. Through her work with the U.S. Department of Labor’s Office of Disability Employment Policy, the White House, and the Mayor’s Office, she has set in motion policies and programs that facilitate independent living and self-determination for people with all types of disabilities. Recently named to the Susan Daniel’s Disability Mentoring Hall of Fame, she is a role model for other young women with disabilities striving for leadership positions. Dr. White has been involved in the rehabilitation and independent living field for over 30 years. Until his recent retirement, he directed the Research and Training Center on Independent Living at the University of Kansas, served as Principal Investigator of the NIDILRR-funded Research and Training Center on Community Living, and worked as a professor at the University of Kansas. Dr. White has had numerous opportunities to work with consumers with disabilities in identifying, developing, and shaping ongoing disability research. He currently serves as a board member of the United States International Council on Disability, and chair of the Advisory Board on Disability for Delta Air Lines. Mohammed is dedicated to bringing emerging accessible transportation technologies to the mainstream. As the Program Manager for the Accessible Transportation Technology Research Initiative and the Research Transportation Specialist at the Federal Highway Administration, he focuses on research related to developing technologies that include automated vehicles, robotics, and artificial intelligence. In 2001 he founded the EquallyAble Foundation, which has helped to empower thousands of people with disabilities around the world with access to education, equipment, and employment. He is currently co-chair of the Transportation Research Board committee on accessible transportation and mobility. About The Viscardi Center Founded by Dr. Henry Viscardi, Jr., who served as disability advisor to eight U.S. Presidents and became one of the world’s leading advocates, The Viscardi Center educates, employs and empowers people with disabilities. It provides Kindergarten through High School education (up to age 21), school-to-work youth transition services, vocational training, career counseling and employment placement, assistive technology, and adapted driver education to children, adolescents, and adults with a wide variety of disabilities. The Center also assists businesses in diversifying their workforces, as well as developing and advancing disability inclusive cultures in their workplaces.